Growing up, my parents loved to do family activities together. 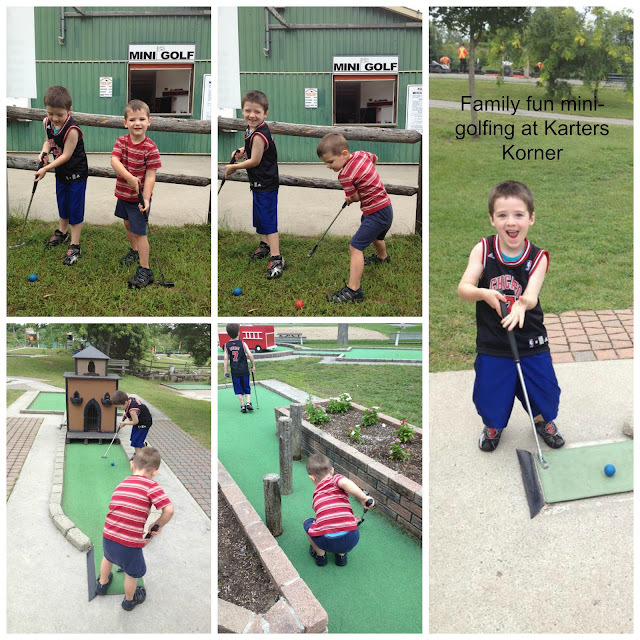 One of our favorites was to go to Karters Korner - they had go-karts and mini-golf, a small arcade, canteen and later expanded to add a driving range. We always had a good time, and I even remember celebrating my birthday there with my friends one year. Hubby and I used to go with friends also, and would make use of the driving range on occasion. Over the last few years, it has expanded even more. 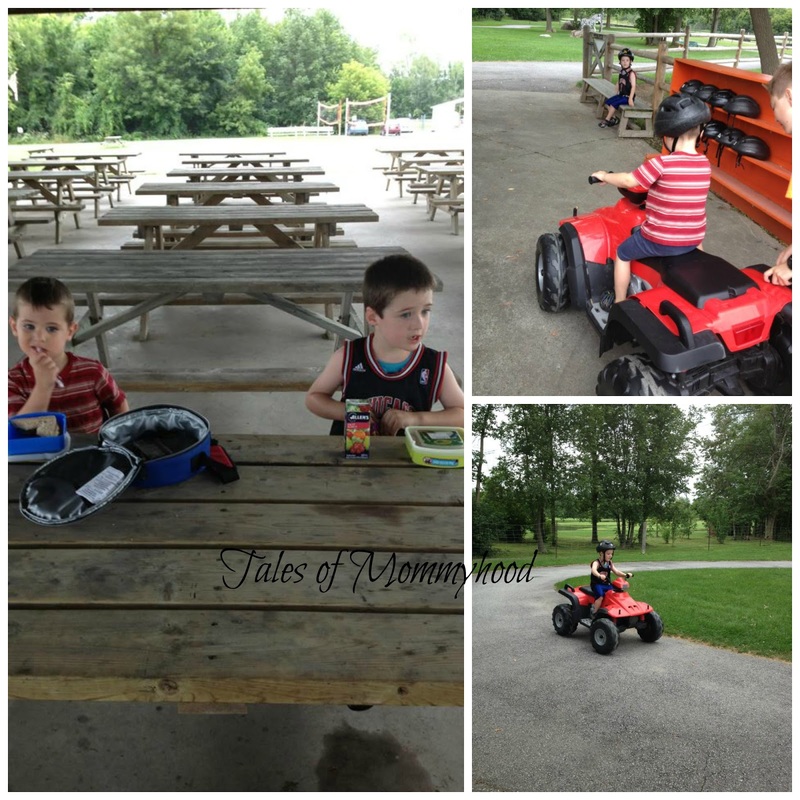 They now have a paintball area, kiddy carts (battery powered 4 wheelers that are child sized for riders under 53 inches) and a large covered area with MANY picnic tables. We started taking Mr. J mini-golfing when he was 4, but had yet to take Mr.K. Today was a beautiful day, so I called my mom to see if she wanted to join the boys and I are on our outing. We arrived right for opening (10am) - which was good because we didn't hold anyone up. As we were finishing the course (and it did not take us long to do, because Mr. K's idea was to putt the ball from the start, pick it up and move to the next hole) the course was starting to fill up. Mr. J actually got a hole-in-one on one of the later holes (not a first for him, I believe he has done that twice before with his dad). The boys seemed to enjoy it (although I won't take Mr. K back this year- maybe next year when he has a little more focus, and less chances of using the club as a weapon). 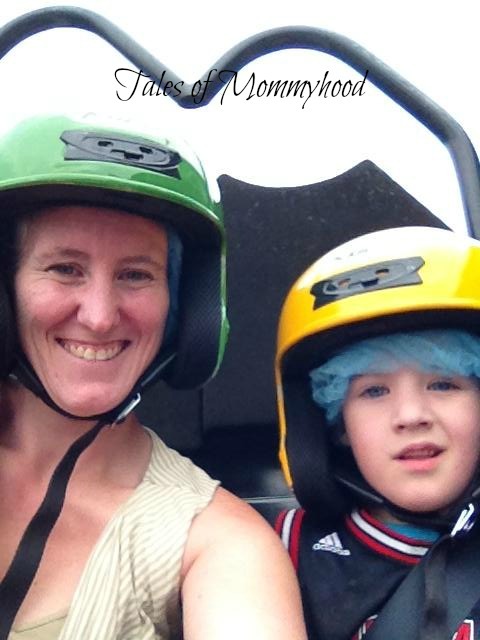 When his 5 minutes was up, we went back to finish their snacks and I surprised him with a doubles ride on the go-karts. He was so excited (although he wanted to drive) and he was disappointed that we only did one lap. I am not a big fan of go-karts, and only like to be on the track when no one else is there, so we had perfect timing as a line was starting to form while we were walking away from the track. We had a really good time, and it brought back some wonderful family memories from when I was a child. It is still owned by the same family too! 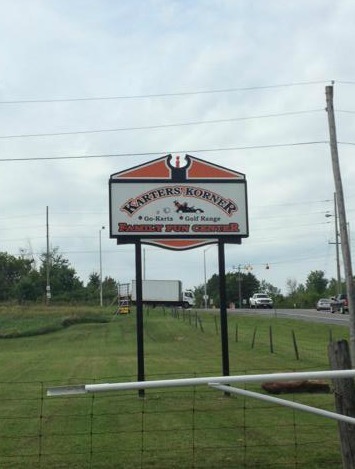 If you are looking for a great place to spend some quality time with your family, I recommend you check out Karters Korner. This looks like a fun place. We have something similar here and it's always good for a fun family day out. The go karts are great! We took our kids out for the day to mini putt at at a place like this one and they had so much fun that we try to take them more often now.It' a refreshing change from the ordinary routine day. 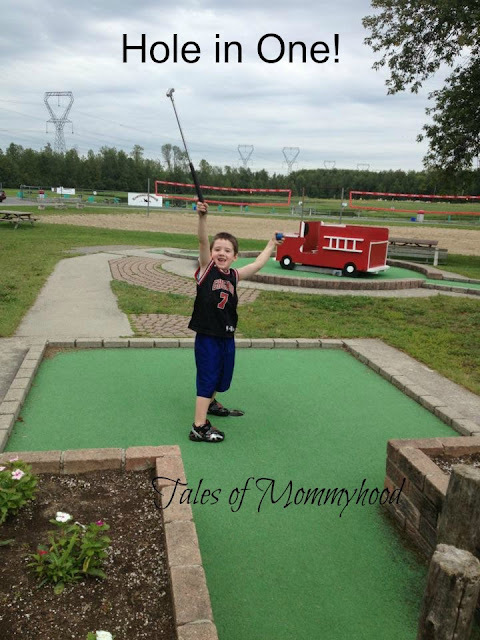 Love Mini Golf, it is always a fun activity for the family! Palm Springs has it all, and therefore whether you are an amateur or a professional golfer, you sure can find something that could test your skills.